Beginning with Windows 10 Anniversary Update, Microsoft Edge will start supporting extensions, including the Pocket extension! 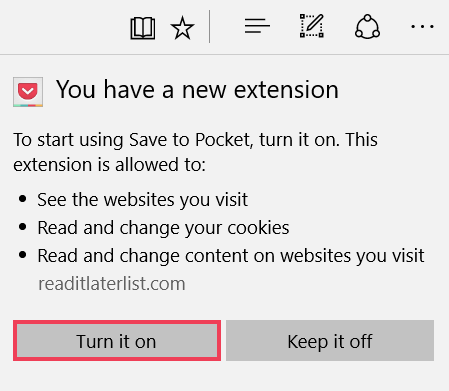 Continue reading to learn how to install and use the Pocket Extension in Edge. Turn it on - Open Edge browser. You'll see a message at the top right corner that says you have a new extension. Click the “Turn it on” button. Add it to your toolbar - Open the ●●● menu. Then, right right-click Save to Pocket, and then click the “Show next to address bar” button. 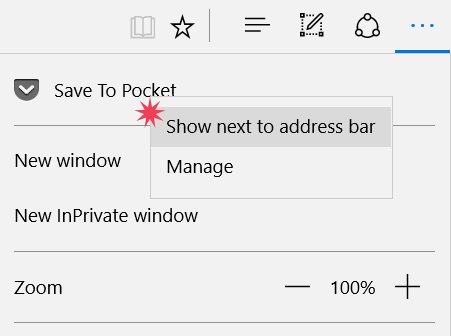 When you're viewing a page that you'd like to save to Pocket, just click the Pocket toolbar button to save it to your list. You'll then see a message that the page has been saved. You can also save links that you see on a web page without opening it first. Just right-click on any link and and selecting Save to Pocket from the context menu. Tip: If you enjoy using keyboard shortcuts, you can press Control + Shift + S to save the page to Pocket. You can do much more than just save a page - you can add Tags, send the item to your Archive, Undo, quickly view your List, and access the Extension’s settings. To add Tags, type tag names into the text box and press Enter. Your tag will be saved automatically. You can also keep typing to add additional tags. If you're looking for an easier way to Tag, Pocket Premium includes Suggested Tags, which are offered automatically after saving an item and can be added with a single click. In addition to saving new pages, Pocket can also be used to keep track of things you’ve already read and may want to reference later. You can Archive the page you’ve saved directly from the Microsoft Edge extension by hovering your mouse over the ●●● menu, then click Archive Page. If you saved a page by mistake, you can undo it. Hover your mouse over the ●●● menu and then simply click Remove Page. You can also go directly to your List by hovering your mouse over the ●●● menu and clicking Open Pocket. 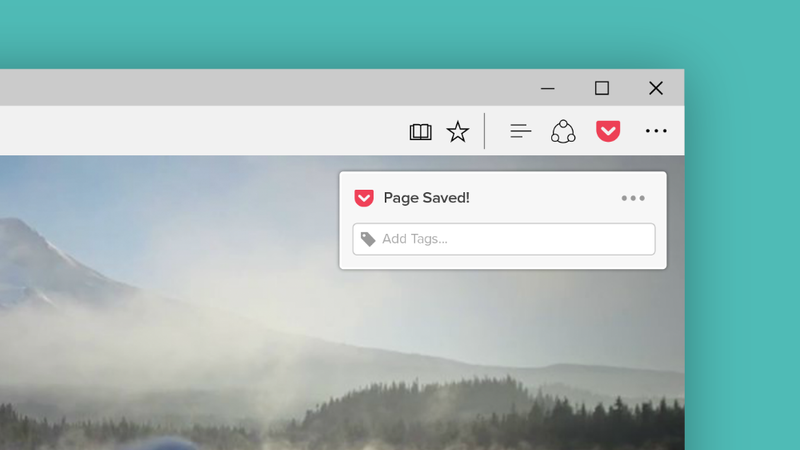 Visit Pocket’s Microsoft Edge Extension settings to access a variety of options, including the ability to edit your keyboard shortcut. Hover your mouse over the ●●● menu and then click Settings to open this page. If you prefer to not have Pocket buttons appear on the sites above, they can be disabled in Settings.